Guess who got arrested ... again?!?!? Sounds like this time around he sideswiped another car on the highway and then, in what at first looked like he was stopping at the scene to check on the other driver, he instead made an effort to cover up his license plates so as not to get caught and then drove off! For some crazy reason, despite repeated DUI citations, a drug and alcohol test was not performed at the police station. On September 9, Cassidy allegedly sideswiped a car while changing lanes on Interstate 595 in Ft. Lauderdale, FL. According to England's Daily Mail, he initially stopped at the scene but it turned out it was only to hide his license plate, at which point he drove away even though his car was damaged and had a flat tire. The man driving the other car was treated by paramedics before being transported to the hospital for further examination. The Daily Mail goes on to say that police tracked the singer down at Cleveland Clinic in Weston, FL later that day and, when they questioned him on the incident, told the officers that he had exchanged information with the driver of the truck and was at the facility for an unrelated appointment.Cassidy was charged with leaving the scene of an accident, making an improper lane change, operating a vehicle with a suspended license and operating a vehicle with an expired registration. He was not tested for alcohol or drugs.The singer has the potential of receiving 60 days in jail, six months probation and a $500 fine. The chances of him receiving the upper end of that sentence is higher as he has two DUI charges from the past two years, one in upstate New York in 2013 and another in California last year. He has also recently gone through a divorce and a personal bankruptcy.Two days after the incident, Cassidy made his now famous appearance on British television where he was combative with the hosts who were asking about some personal matters. Cassidy is due back in court on October 27. In what seems to be a never-ending cycle here late of 12 and 14 hour days, I had to miss the Lifeforce concert at The Genesee Theatre this past Thursday night, something I was very much looking forward to. We were, however, able to send a few Forgotten Hits Readers to the show, thanks to a generous ticket give-away offer courtesy of the Genesee Theatre and Colleen Rogalski ... so we asked a couple of those folks to share their reviews with the rest of our readers. Regarding the Lifeforce concert, you missed a great one!!! First, thank you so much for the tickets. We loved it. Very different from Peterik's usual concert material, but wonderful. 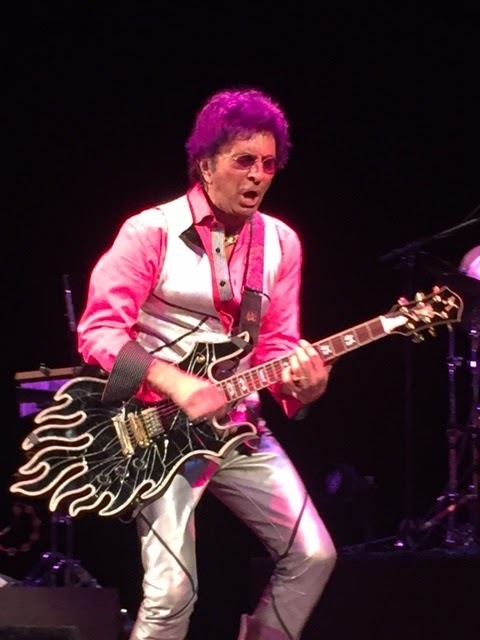 Jim Peterik has put together another classy band, including World Stage and Pride of Lions musicians. Mike on guitar, Clem on bass, Ed on drums, and Steve on sax and percussion. Colin Peterik, his son, did background vocals and rocked the house with his original song. Also on background and lead vocals was Yvonne, who partnered with Peterik on a unique version of The Search is Over. Another highlight was a slow-downed version of Survivor's Is This Love. They had the crowd on their feet. 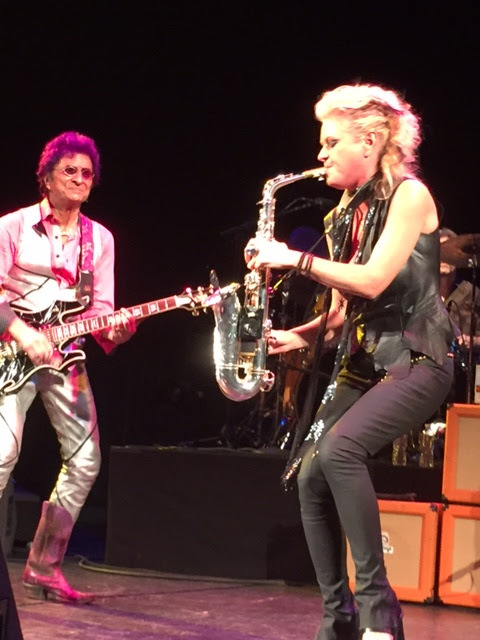 Next up was Mindi Abair on sax. Wow! She played her music and songs she wrote with Jim. It was fabulous. The only complaint we had was the concert was too short at an hour and forty minutes. We could have sat there all night. If you have a chance to see Lifeforce, don't miss it. You won't be disappointed. Peterik, as always, delivers! Thanks for the tickets. The show was great. Peterik was clearly enjoying himself, as he always does. 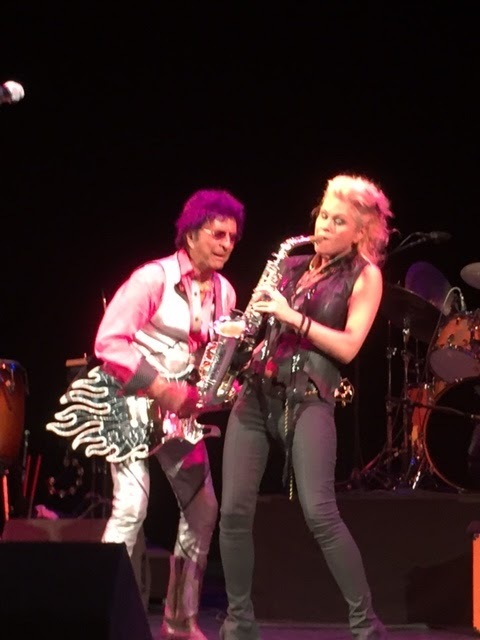 Mindi Abair on sax was hot, in more ways than one. I'll be picking up her CDs to hear more of her. It was sad to see the show only drew 300-400 people. The Genesee is really a nice room. Here are some great action photos from the Genesee show, courtesy of Jean Mikota ... gotta check these guys out next time around! 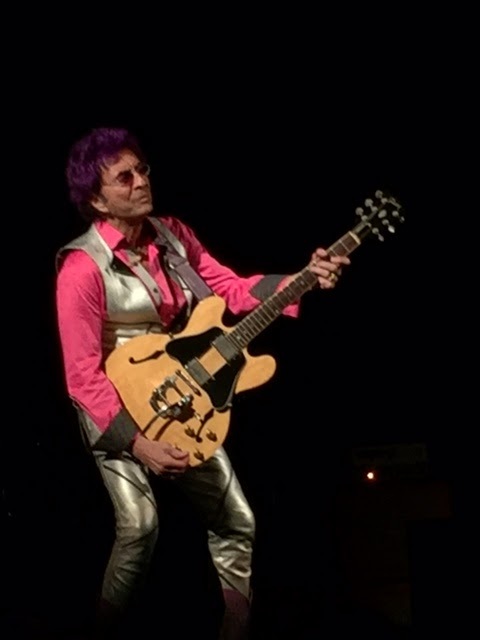 I think it is great that Jim Peterik and others have helped put this long needed show together with WTTW. Too bad Bob Sirott or Bob Stroud OR Carl Bonafede could not have emceed this one. My passion for these bands has only increased as the decades pass. Jim Pilster has long hoped for such an event, as well. I often think of the BIG 6 when thinking of Chicago's greatest 60's Top 40 bands and for once, all will be there in some form. I have done some work for CDs by all: Cryan Shames, Ides, NC6, American Breed, Shadows of Knight and Buckinghams. They all are unique and helped create what is the Chicago Sound. These six bands have been the TRUE cornerstones of the city's 60's Top 40 musical shape. The fact that ALL of the original (and other important) lead singers of each band will be singing is especially pleasing! I hope more members will be able to attend or play also. I wish the Mob could perform with this group. It is great to know there will be a memorandum segment for Chase and others. It is sad that many of our beloved top 40 60's faves have passed, but will always be remembered. Jimy Rogers, Jeff Boyan, Isaac Guillory, Jon Paulos, Dave Purple, Ray Herr, Joe Kelley, Dee Robb, Bill Chase, Mitch Aliotta and John Jeremiah, Minnie Ripperton, and many others should be remembered at this time. 50 years have passed since most of these bands formed and became household names in Chicago homes that had teens tuning their ears towards WLS and WCFL for the newest bands from the Windy City. I wish you all a great time reliving what we fans have always embraced as the best times of our lives! I'm going. As soon as I heard the announcement I went online and got tix. We were able to give our Leon Russell tickets away to another Forgotten Hits Reader ... and he's even a bigger Russell buff than I am ... so it's a win/win for everybody. Thank you so much for the latest news on the upcoming Channel 11 Concert of all the Chicago Groups. Please let us know when it will air! So sorry to hear about Frankie Ford passing. I saw him perform during the taping of one of the Do Wop shows in Pittsburgh for Channel ll. He sounded great and I had the opportunity to meet him and have my picture taken with him. He was a great keyboard player, too. Cant wait to find out about the tickets giveaway for Brian Wilson's upcoming concert in November!!! Hoping to have something up on the site next week regarding the Brian Wilson show. We've only got a few tickets to give away for this ... so we're going to make you earn them! Stay tuned. Skip Haynes here. FYI, I'll be coming into Chicago for the "Cornerstones of Rock" special because Lake Shore Drive is the finale of the show. Apparently, everyone will be singing it so they asked me to lead the song - as kind of a tribute to Mitch and John. Maybe we can hook up for coffee. Just read this year's annual rant about the HOF. Of course you're correct in your assessment but also of course our opinions don't matter to them. I'm sure you'll get lots of mail reminding you of your failure to mention other worthy ones but I think the HOF's single biggest exclusion has to be Connie Francis. She certainly was the lead female singer in the first decade of rock and roll and to exclude her because her songs weren't hip enough is just plain wrong. And how about finally recognizing Ed Sullivan??? HE's the guy who brought rock and roll right into our living rooms every Sunday night. How is it even possible that he has never been so much as nominated. Stones and Beatles isn't just bad its pathetic. Chicago, Tommy James and Paul Revere should have gone in years ago. One salient point: where the hell is Ed Sullivan? His long running, prime-time Sunday night show literally "made" groups over night. Chances are Jann Wenner, the clueless editor at Rolling Stone mag, has no idea what Sullivan's impact was on rock 'n roll. Until further notice, the Rock 'N Roll Hall of Fame in good old Cleveland, Ohio, is just another tee-shirt shop. We've pointed it out before and we need to point it out again ... the Museum in Cleveland has absolutely NOTHING to do with the nomination and balloting process of who gets in ... SEVERAL members of the Museum (including some of the highest higher ups) have told me off the record that they are just as mystified as the rest of the world when they see the names of some of the most obsucre, off-the-wall choices on the nominees ballot each year ... and they, too, believe that the institution known as The Rock And Roll Hall Of Fame has lost ALL credibility (and sight of their original purpose) YEARS ago. They are embarrassed by these actions. That being said, they still manage to house a BEAUTIFUL museum that pays tributes to ALL brands of rock and roll, past, present and future. I don't get overly excited over country music of the late 70's and 80's, but Ronnie Milsap was one whose music I truly loved. I first heard him on the jukebox at our local tavern I visited often in my post-college drinking days. The song was "Daydreams About Night Things." I loved it and started to hear him as he crossed over to pop charts and every song was great. He even did a great pop song with great video for "She Loves My Car." Obviously, it was funny, since he is blind. He does cameo spots in the video, but this song SHOULDA been a pop hit. If Huey Lewis or ELO had recorded it, it could have been top 10. That said, Ronnie's country hits were all just awesome. Faves likely are "It Was Almost Like a Song" and "In No Time At All" besides the one above that got it started for me. Of course, he also had a hand in Los Lonely Boys' success years back, too. Imagine finding a rare, live Beatles recording from 1962 ... one of only FIVE known to be in existence ... in your desk drawer. Well, that's exactly what happened ... and now this incredibly rare disc is going up for auction. Spent the last weekend catching the Beach Boys in concert. 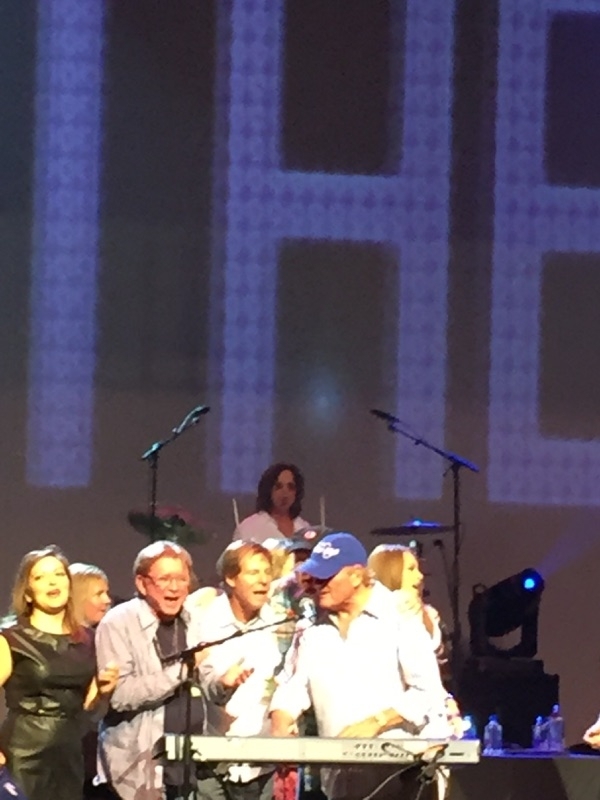 My pal Bruce Johnston invited me and friends on stage to sing Barbara Ann with them. What a thrill. Here we are with Johnny Titlotson. The Rock Pack Feat. Mickey Thomas of STARSHIP, Bobby Kimball, original lead singer of TOTO, Steve Walsh formerly of KANSAS, Robin Zander of CHEAP TRICK, Fee Waybill of THE TUBES, and John Payne formerly of ASIA! 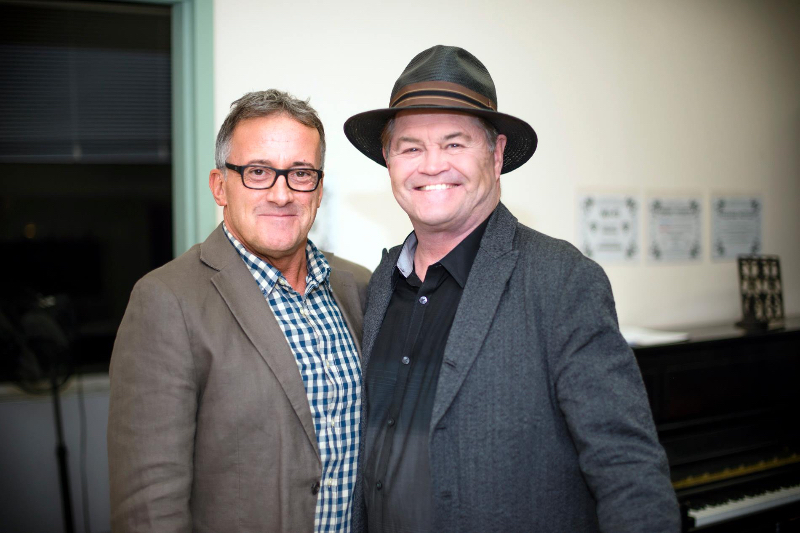 Micky Dolenz's new album "A Little Bit Broadway; A Little Bit Rock & Roll" (Broadway Records) was officially released last Friday. Last Thursday night he sat in with The Roots on The Tonight Show with Jimmy Fallon. Backstage at the Jimmy Fallon taping, he ran into NSYNC's Lance Bass who was in the building taping another show. Here are photos of Micky Dolenz with Lance Bass and Micky with PR-man David Salidor. Thanks for sending, David! Aww, what the heck ... here's one of ME and Micky, too!!! The Zombies are on our shores, and they have a new album out October 9, which is really quite good. The group is still led by Rod Argent and Colin Blunstone. Seems their longevity might have been helped by the dissolution of the band in 1968, which probably reduced some wear and tear. Remarkably, they're still in peak form. What's really amazing is that they never performed songs from Odessey and Oracle, since they broke up before it was released. Only recently they have learned to play these songs live. I had a great chat with Colin where he talked about their career and told the stories behind some of those amazing Zombies tunes. 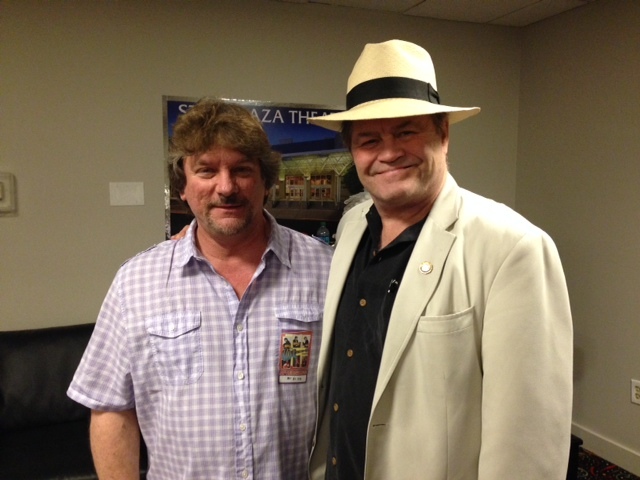 We also talked about the Alan Parsons Project song "Old and Wise," a great tune in which he lent his voice. The Zombies start their U.S. tour today on Cape Cod, and I can confirm for any FH readers that if the tour comes to their area, it’s well worth the investment of time and money. I have seen them several times and they are simply: TERRIFIC. Here are a few of the 'Child Star Seminar' photos. These are from the recent Mid Atlantic Nostalgia Convention. Stu Shostack was the panel moderator for this panel. The stars were Barry and Stanley Livingston plus Tina Cole from My Three Sons, Jon Provost from Lassie and Angela Cartright from Make Room for Daddy. Just letting you know that on last Friday night Paul Haney, who works with Mr. Whitburn on his books was on the Crap From The Past show http://crapfromthepast.com/ on KFAI-FM http://kfai.org/ radio with host Ron “Boogiemonster” Gerber. They had a quite informative discussion about Joel Whitburn and his books and archives / vault. You can listen to this for another week or so from the KFAI website or from the ” Crap from the Past” website. Ron has a great radio show on Friday nights from 10:30 to midnight dealing with many obscure and lesser know tracks out there. You are better off to just listen once than me try to tell you about it. You will be hooked. A FIRST FOR MUSIC HISTORY! 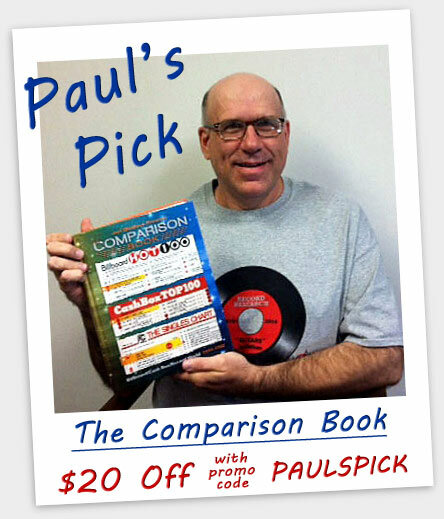 The Comparison Book contains our basic chart research of the pop singles charts of America’s three top music industry magazines: Billboard, Cash Box and Record World (known as Music Vendor prior to April of 1964). New research now shows everything that appeared below the Top 100 of Music Vendor and Record World’s pop singles charts, not just the exclusive titles that appear in our sold-out #101-150 Hit Records book. I just watched this episode of Colombo this morning. Vintage Fats Domino Concert From 1973 Released In Its Entirety For The First Time Ever! Los Angeles, CA - Fats Domino’s studio recordings inspired everyone from reggae legend Bob Marley to The Beatles, whose “Lady Madonna” was as a direct homage to the early rock pioneer. But while his songs were often imitated, Fats’s live performances were absolutely untouchable, a rollicking ride through boogie jump classics like “Let The Four Winds Blow” and “My Girl Josephine” on to his all-time classic hits such as the libidinous “Blueberry Hill,” “Ain’t That A Shame,” “Walking To New Orleans” and many more. On stage, Fats attacked his piano from every which way as sweat poured from his brow, all the while keeping that magnificent, signature smile front and center, making everything he did look as effortless as a pleasant Sunday stroll. Now music fans will once again be able to hear this early rock pioneer’s explosive energy on a 1973 recording released on CD in its entirety for the first time ever this October 2 from Goldenlane Records. Thrillin’ In Philly - Live 1973 features an amazingly clear, professionally mixed multi-track recording that brings Fats’s brilliant hits to life. For good reason to as music journalist Dave Thompson’s liner notes reveal, this show captures Fats in the midst of a stellar, career-reviving tour that introduced him to a whole new generation of fans. He was playing for posterity, to preserve his legacy, and you can hear it! Doc Watson: Live at the Bottom Line – These 2002 live recordings capture the guitar virtuoso on the heels of his sixth Grammy win (out of eight), showcasing his trademark wit, charm and prodigious musical gifts. Regarded as the father of modern day Bluegrass flat-picking, Doc Watson creates the easy intimacy of a back-porch performance as he walks his adoring audience through a musical history lesson encompassing “Shady Grove,” “T for Texas,” “Black Mountain Rag” and “Nights in White Satin.” Recorded during Doc’s two final Bottom Line engagements, captured just before, and shortly after, his 79th birthday. He had played the club over 30 times before. Tony Orlando: Live at the Bottom Line – The first and only live album in Tony Orlando’s career, this post-New Year’s Eve show from January 2001 presents the artist as entertainer and singer in a range of musical variety from pop, to ballad, to Latin, to rock and roll, to heartfelt stories from his nearly 50-years in music. Career highlights include being the first multi-racial group to have a TV show (Tony Orlando & Dawn) and starring roles in award-winning Broadway shows, Barnum and Smokey Joe’s Café, all while selling millions of records. This electric performance at The Bottom Line includes early hits “Yellow Ribbon,” “Knock Three Times,” and “Candida” as well as three new original songs including “Caribbean Jewel,” a tribute to his Puerto Rican heritage. These releases are the third of an extensive quarterly roll-out of 24 new titles over the next two years, including classic live performances by Jack Bruce, Ralph Stanley and Rory Gallagher, among others. The next releases are scheduled for March 2016. Bottom Line co-founder / curator Allan Pepper has recordings of more than 1,000 shows from Greenwich Village nightclub, which always booked an eclectic mix of rock, jazz, blues, folk and other forms of music. Pepper says the label is currently in conversation with representatives from many of the acts. The Bottom Line Archive can be pre-ordered on Amazon and iTunes; and available on all digital providers. Previous editions of the BLA series with Harry Chapin, Janis Ian, The Brecker Brothers, Kenny Rankin, Willie Nile and more are also available on Amazon and iTunes. The Bottom Line was a legendary music venue at 15 West 4th Street in Greenwich Village. Owned by Allan Pepper and Stanley Snadowsky, the Bottom Line opened February 12, 1974 and enjoyed a 30-year run. Bruce Springsteen played showcase gigs at the club and Lou Reed recorded the album Live: Take No Prisoners there. Harry Chapin held his 2000th concert at the Bottom Line in 1981. The Bottom Line hosted an extremely wide variety of music. Among the thousands who performed on its stage were: Eric Clapton, Linda Ronstadt, The Police, Billy Joel, Patti Smith, Hall & Oates, Prince, Van Morrison, Emmylou Harris, Dolly Parton, Betty Carter, Ravi Shankar, Ramones, Miles Davis, Bill Evans, Charles Mingus, Neil Sedaka, Al Kooper, Tom Waits, Peter Gabriel, Cheech & Chong, Sam & Dave, Southside Johnny, John Cale, Laura Nyro and many more.